Our ARV pipe and joint system is an adaptive material handling system for lean manufacturing programs and to support continuous improvement. 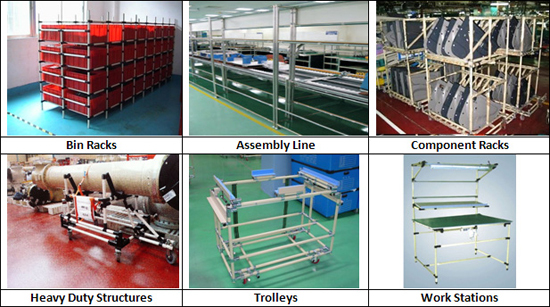 We have a broad range of plastic coated steel pipes, C NICO pipes, powder coated pipes, stainless steel pipes, clamps and accessories that can build a variety of structures at workstations, flow racks, carts and other material handling and storage structures that can be reconfigured again and again to match manufacturing, storage and assembly needs. ARV pipe and joint system is versatile and cost effective. The system components are easy to design and assemble, requiring no special tools or technical skills. The system provides a multifunctional aid to concept engineering, allowing continuous and cost effective improvement to designs.